The CDCN13 Series has been discontinued. Please see the PHUCN600 Series as a possible alternative or contact our Flow Engineering Department. The CDCN13 is a fully programmable controller designed for complete chemical automation (conductivity, pH and ORP) as well as control of chemical additives, all with data logging, RS232 communications, and available RS485. This controller can easily handle cooling tower, boiler, industrial process water, food processing, drinking water and wastewater treatment applications. Featuring high accuracy and easy installation and operation, engineering units can be displayed in either US or metric values using the 16-button keypad and the large, 8-line LCD readout with simple scroll-through menus. Standard features include conductivity control, with the ability to control 4 additive feed programs. You can get a readout of the probe temperature. 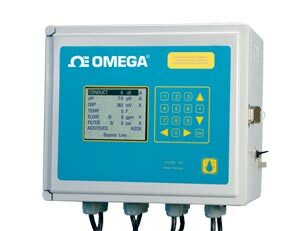 pH and ORP measurement and control is available, as is a safety flow switch contact, and RS485 communications. The CDCN13 has 8 control relay outputs, for up to 4 chemical additives, fill valve, bleed valve, probe rinse, and remote alarm. Standard features also include dynamic probe failure testing for pH/ORP sensors, allowing the controller to detect a probe failure quickly after it occurs, so the user can avoid dangerous out-ofrange conditions. The automatic probe rinse can be used for either manual or automatic cleaning of pH or ORP electrodes. 참고: Comes complete with operator's manual and 3V lithium battery. When ordering the conductivty or pH controller, it is recommended to purchase pH buffer solution.